Citation: C N Trueman "The English Church from 1550 to 1553"
When John Dudley, Duke of Northumberland, gained power in 1550 after the fall of Somerset, religious reform in England and Wales became more radical. The changes that were made were such that any hint of Catholicism that existed under Somerset was removed so that by 1553, the Church of England was Protestant. Historians argue as to why government reform became more radical after 1550; some argue that the government felt more secure after the Western Rebellion was put down and was confident in its own ability to enforce changes; others argue that anyone who wanted to lead a rebellion was sufficiently put off by the events in Devon. Probably both are important in explaining why Dudley and the Privy Council felt more confident about introducing major religious reform. Dudley himself played a pivotal role in the introduction of these reforms. However, Dudley himself cut a curious figure from a religious point of view. Whether he was a committed Protestant is hard to argue as he re-converted to Catholicism just before his execution. However, this re-conversion may well have been a last desperate attempt to get his life spared. But it does show that he did not have the conviction of those Protestant martyrs who were executed in the reign of Mary I. Yet Dudley was an energetic supporter of John Hooper, someone who wanted England to convert to Protestantism sooner rather than later. Few doubt that Dudley was willing to use religion and religious reform to advance his own political power. At the fall of Somerset, Dudley was associated with the conservatives in the Privy Council. However, when the conservatives in the Council pushed for the withdrawal of the 1549 Act of Uniformity and to give bishops greater power, Dudley moved to the radicals in the Privy Council. In December 1549, Parliament passed laws that would speed up the removal of images in churches and enforce the use of new versions of the service book. By February 1550, Dudley felt sufficiently in control of the Privy Council to make a move against the conservative bishops. Stephen Gardner was in the Tower at that time. He was ordered to agree to the doctrines of the Church of England. Gardner refused to do this and was sentenced to stricter terms of confinement. Bonner, the Bishop of London and a noted conservative, was retired after a spell in prison. Other conservative bishops were also retired and replaced by those willing to support reform. This happened in Rochester, Durham, Exeter, Chichester, London and Norwich. To all intent, Dudley was putting his men in positions of great importance. There was minimal opposition to this. Some pro-Catholic pamphlets were printed but their impact was negligible. With these men in place, more radical reform could be introduced. The first move towards full Protestantism came from Nicholas Ridley, Bishop of London. He ordered that all altars had to be removed and replaced by communion tables. This was in line with the teaching of John Calvin and Calvinism. Across England and Wales, a new format for the ordination of the clergy was introduced. This new format was virtually a Lutheran one and it empowered clergy to remove any reference to Purgatory, sacrifice and prayers for the souls of the dead during Mass. While this move satisfied the moderate reformers, it did not satisfy the more extreme. Their main complaint was over the vestments worn by the clergy during services and Mass. They considered the mitre, cope, stole and tippet to be relics of superstition and Catholicism. John Hooper, the man who Dudley had supported, refused to take up the offer of the Bishopric of Gloucester over the issue. In October 1550, Dudley ordered Hooper to stop preaching. He refused and in January 1551, Hooper was imprisoned. It was only when Hooper was willing to show some compromise that he was released and took up the position of Bishop of Gloucester. No major reform was introduced in 1551. The year saw Cranmer revising his ‘Prayer Book’ and the conservative Gardner was finally removed from his position in Winchester. Parliament assembled in January 1552 and the government started on a comprehensive programme of religious reform. To enforce doctrinal uniformity, a new Treason Act was passed which made it an offence to question any of the articles of faith of the Church of England. It was also an offence to question royal supremacy. The number of Holy Days was limited to 25. 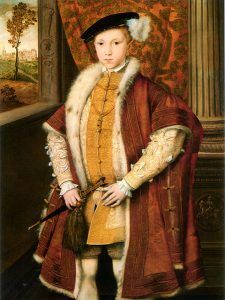 In March 1552, a second Act of Uniformity was passed. This made it an offence for any member of the clergy or laity not to attend a church service. Offenders could be fined or imprisoned. Cranmer’s new ‘Book of Common Prayer’ became the official basis for Church of England services. All semblance of Catholicism was removed. The Eucharist was confirmed as consubstantiation. However, the more radical reformers found complaint with this as communicants were expected to kneel which some deemed to be idolatrous. A review of Church wealth carried out in 1552 estimated that the Church was worth over £1 million. The government decided to take steps to acquire some of this wealth. However, the untimely death of Edward VI stopped this from going through. The new inquest into Church wealth was explained by Dudley being greedy. However, the government had been pushed to bankruptcy by wars with Scotland and France and it may simply have been financial expediency that caused Dudley to set up this enquiry. By the time of Edward’s death, there was a recognisable Church of England with characteristics that were plainly Protestant. After a number of years of religious upheaval, many would have welcomed an era of stability. The death of the Protestant Edward and his Catholic successor, Mary, ensured that this was not to be the case.